Ecommerce companies need to make sure that consumers have easy access to all the information they might want about the products they're looking to buy. Google Manufacturer Center and Salsify are two of the most powerful resources available for ensuring that this is the case. Google Manufacturer Center is a tool that just about any brand can utilize, increasing impressions and maximizing shoppers' awareness of participating products, and Salsify can play a key role in boosting the performance of this resource. The program allows brands to provide detailed, accurate data about their products directly to Google. So why does this matter? It's simple: The better a company's products are represented, the more people will click "buy." "Adding the brand name as a prefix in PLAs led to 50 to 70% more impressions." This isn't just speculation. During a webinar, Christian Santiago, strategic partnership development lead for Google, highlighted a number of experiments that Google ran to test how much of an impact product representation has on sales figures. In one controlled experiment, Google found that product listing ads which had been modified to include extra attributes, including more color and text descriptions, attracted 10 percent to 20 percent more impressions than less robust PLAs. In another experiment, adding color descriptions into product titles boosted PLA impressions by 20 to 30 percent. And, in one last experiment, Google found that adding the brand name as a prefix to product titles in PLAs led to 50 to 70 percent more impressions. Most importantly of all, these steps can lead directly to greater sales. As a case in point, the case study highlighted Speakman, a retailer of bath and shower products. By partnering with Salsify, Speakman was able to put accurate, detailed product data right in front of a huge number of potential customers' eyeballs. The result? 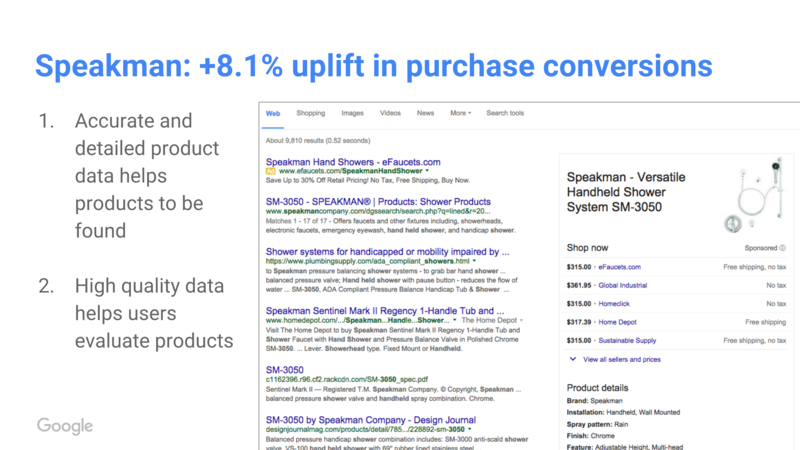 Speakman enjoyed an 8.1 percent uplift in purchase conversions. You just can't ignore numbers like those. Thanks to Manufacturer Center, that's no longer the case. Now, brands can submit their own product content, ensuring that consumers see only the best data about the brands' offerings. Critically, this is true even when the retailer pays for the PLA. In fact, we recently partnered with CPC Strategy on a guide to the top Google Shopping Feed optimizations. Get this guide now to improve rankings of your product pages and Google Shopping ads. After you submit product content, Google will prominently display that information whenever a user conducts a relevant search. This data can include everything from photos and videos to size and weight, colors, and accurate text descriptions. This allows brands to influence how they are represented on Google properties, instead of simply sitting back and hoping that the search results accurately and effectively describe the products they're offering. This in turn drives more people to click the "buy" button. Google Manufacturer Center in action. In order to success, brands need to take the issue of product content accuracy seriously and work with retailers, search engines and other digital outlets to address inaccuracy online. In a recent survey of 250 brand manufacturers and retailers, a majority of executives said a majority of their content was innacurrate online today. Making sure product content is accurate and complete is key to meeting customer expectations - but it's only possible when there is a clear, consistent process for brands to submit data. 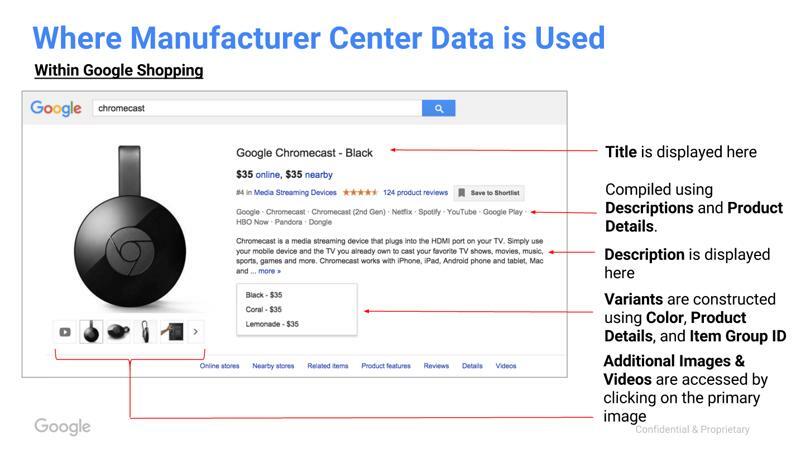 Meg Mason, operations lead for Google, points out that Google reviews all of the product data that eCommerce firms submit for the Manufacturer Center program. Google's review is extensive - the search giant looks for straightforward errors such as spelling or punctuation mistakes, but also calls out factual inaccuracies and even a lack of specificity. Any shortcomings or mistakes here can lead to rejection. With that in mind, Mason and other Google personnel participating in the webinar strongly urged brands to work with a company like Salsify to make sure they get the most value out of Google Manufacturer Center. "We recommend working with a partner such as Salsify," Mason said. "As product data experts, they can help you map your existing data into our Manufacturer Center feed attributes." It's not just an issue of accuracy, either. Brands need to ensure that consumers have a consistent shopping experience. If product descriptions vary from one platform to another or one retailer to another, that will create uncertainty and confusion. And if a consumer is unsure, he or she is likely to move on. Learn more about Google Manufacturer Center, Salsify, and how the two can come together to deliver your brand more visible, effective shopper impressions.